We took a look at some of the very best available right now, and we reckon there must be one among our list of 10 for you, so let’s have a closer look at the top 10 as we see it. 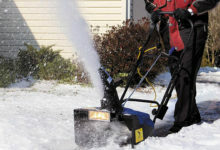 So Which Snow Rake Is Best? This is one with something of a difference, and we like it a lot! 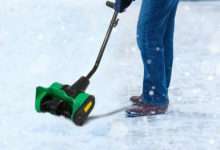 The Avalanche roof rake a complete removal system that, by clever design, removes snow from surfaces by effectively cutting it away, and delivers it via a clever slide. 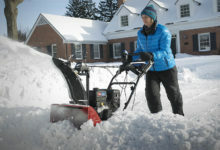 While it seems small at just 17” x 8”, it can, in fact, remove a ton of snow a minute, which is a great amount and does so with relative ease and efficiency. Read our full Avalanche snow roof rake review here. 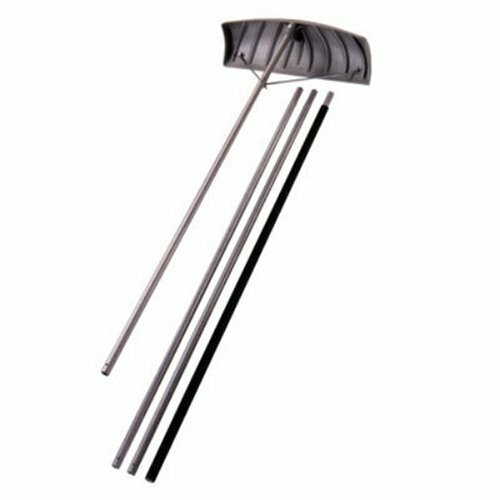 The Avalanche snow roof rake also comes with wheels that can be fitted to make things a lot easier and to protect the roof shingles and any other surfaces you may be working with, and it is a four-part construction that simply snaps together, with no further tools needed. If there is one negative it could be that this one weighs around 10lbs, which as roof rakes for snow go, isn’t far off the average weight. The standard design of snow rakes is akin to this, but there are some clever differences with this one. Indeed, it features a patented roller system – small, free-moving rollers attached to the base of the frame that surrounds the scoop mean the actual bucket never touches the shingles. This gives you added protection to the fabric of the roof, and also makes it easier to roll up and down the roof among the gathering snow for faster action. It’s a 21’ reach model that is also made from aluminum, yet this one is somewhat bulkier than that above and weighs in at almost 6lb. The handle is in 4 sections in order that you can vary your reach. It’s a very decent rake that can also be bought in a smaller 16’ version – so if you have a lower building that may be a cost-saving for you – and it is very durable too, so certainly worth considering. One of the leading brands in winter equipment for household use, Snow Joe is always on the lookout for innovative design touches. Rather than being a multi-piece construction – as the two above are – this is a telescopic design. The handle is, when at its shortest, 6ft long, and can be extended in one easy move to as long as 21ft. It is extended by a twist and lock motion that allows the inner tube to move, then locks back into place, so you can have it at any length between maximum and minimum. Designed to be light and easy to handle – it weighs a little under 6lb which is heavier than some but still light enough to handle – this one offers a 25” x 6” blade for clearing away decent amounts of snow, and is a simple design that needs no construction. This is a quality brand. 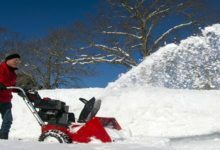 We will be talking in more detail about the features you need to look for in a snow roof rake, but quite clearly, one of them is the reach it has, as determined by the length. This one, from XtremepowerUS, is a 21-foot rake, which makes it perfect for those porch roofs and more inaccessible areas. It’s neatly made, from durable aluminum – another thing to look out for – and is suitably light at around 4lb, which makes it easy to handle. 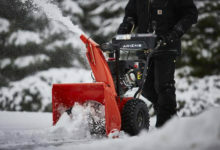 The 25” x 6” blade gives you plenty of clearing power, too, so you can move a good depth of snow in a very short time. 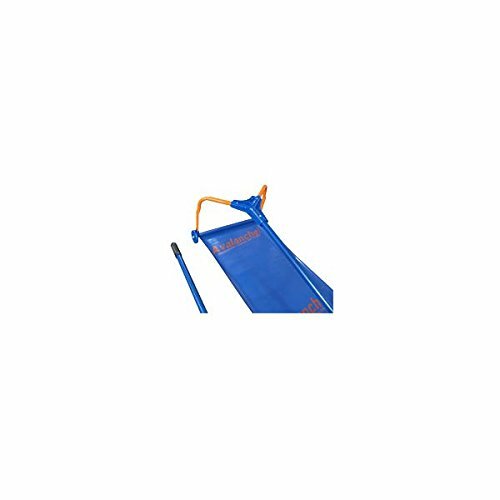 It comes in three sections, which means you can reduce or extend it to your requirements, and it is very sturdy and durable too. 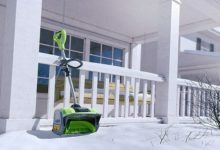 This is a very nice, very typical snow roof rake that comes to you disassembled – it’s easy to put together so no worries there – and at a sensible price, so well worth adding to the shortlist. The easiest, fastest and safest way to remove problem roof snow all while standing on the ground. Back to the standard type of snow roof rake for this one, and it’s a very nice model that comes with some excellent attributes. For a start, it can reach as far as 24-foot – that’s one of the longest of all on this list – and does so with efficiency and effectiveness. It is made from very strong, very durable aluminum, but that does put a premium on weight, as this one comes in at more than 10lb. This snow rakes pole is in four 6ft lengths, so you can choose anywhere from 6ft to 24ft with intervals in between, and it has a clearance blade of 2-foot for a wide and effective path. It’s easy to use but compared to some here, it is quite expensive. However, we cannot emphasize enough that this is a quality item – so make sure you check it out further. One of the leading brands in winter equipment for household use, Snow Joe is always on the lookout for innovative design touches. Rather than being a multi-piece construction, this is a telescopic design. The handle is, when at its shortest, 6ft long, and can be extended in one easy move to as long as 21ft. It is extended by a twist and lock motion that allows the inner tube to move, then locks back into place, so you can have it at any length between maximum and minimum. This model is smaller than some at just 15-feet in length – that’s with all three of the 3-foot sections in place, you can use any combination – so will be good only for those with smaller, lower buildings to clear. Having said that, it’s a well-made model that has strong aluminum handle sections and a non-slip handle, so is easy to use and very versatile. It’s also light, at not much more than 4lb, so is simple to move around. One thing that we should mention is that the 24-inch blade is a plastic version, although a very strong one at that. Some of the above have aluminum blades which are inherently stronger, so if you have a lot of snow to move, this might not be the one. Nevertheless, it’s good, and it comes at a sensible price. This is a model with some interesting features, not least that the clearing head is some 16” deep which gives it extra clearing depth. However, its reach is nowhere near as long as some of those featured, so we can only say that it comes recommended for perhaps heavy-duty use on lower roofs and other surfaces, where it will be very effective. 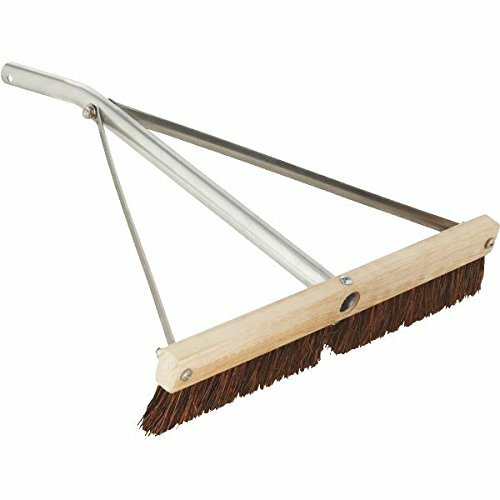 Given the small size of this roof rake for snow – the maximum length is little more than 4ft – it is no surprise that it weighs in lightest of all at less than 2lb, and it is made from very durable aluminum so can clear heavyweights of snow very quickly. The telescopic handle is a neat touch, and it is great for occasional use, but we can’t see how it will compete with, for example, a 21’ pole. 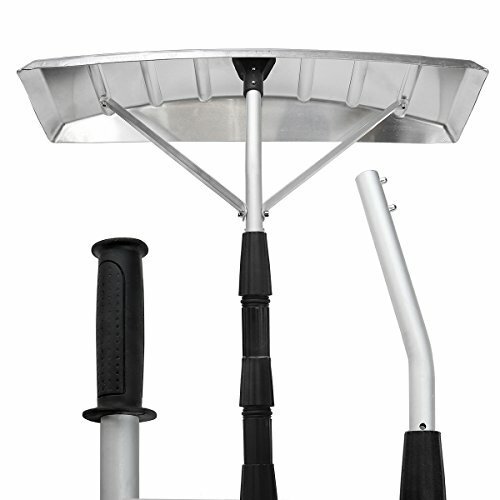 MULTITOOL RAKE: Suncast Roof Rake can be used to rake leaves or shovel snow off the roof of your house, shed, or garage! 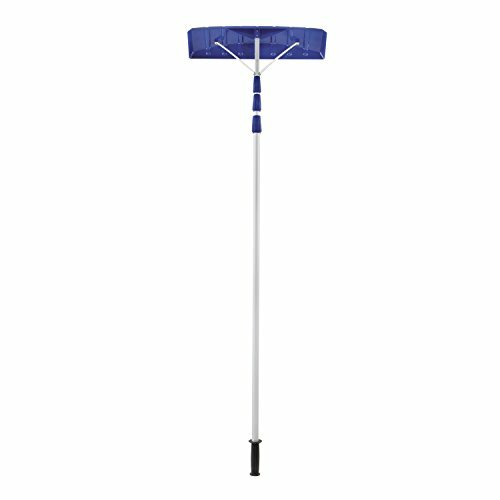 IDEAL SIZE: The roof rake measures 4.3" x 4.5" x 62.3"
This is a standard-type of snow roof rake that makes a lot of sense, especially at what is a very decent price. 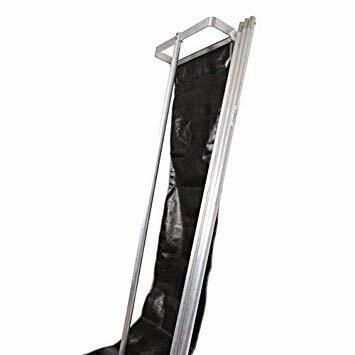 It’s a typical design – you get four sections, so you can have a minimum of around 6ft and, when all four are together, a full reach of 21ft or increments in between – and it is well-made from quality aluminum for the handle, for excellent strength and durability. This one has a 24inch x 7inch blade – that’s deeper than many on here and good for heavy falls – that will clear away a lot of snow in very quick time, and the blade itself is graphite so it does not stick when wet. It weighs less than 8lbs when in use, not the lightest but by no means heavy, is easy to use and nicely made, and we think it’s one to look at carefully. Our final choice is another well-made model in the traditional design. This one offers a maximum reach of 17ft and is a telescoping design, so there is no need to connect the parts of the rod together. It’s made from durable aluminum so will last a long time, and comes with a usable weight of around 5lbs so is very light indeed. A 24-inch poly blade is a clearing end, with a rubbing strip that gives it extra anti-wear capability, and it is easy to use and a sensible price. However, we feel that – in this general company – the slight length of this one lets it down, even though it is a capable device. Worth a look if you don’t need a long one. Reach – the length of the handle, and the reach it provides is of primary importance. Those above stretch from 15 to 24 feet. Weight – you want one that is light enough to move around easily, but not so flimsy it will break under the weight. Width – how wide is the clearing blade or scoop? These range from less than two feet to around 25inches, so choose carefully. That’s really it for a snow roof rake, so which of the above is for you? 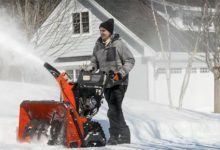 It’s difficult to make a choice as most of the above 10 do the job as far as roof snow removal tools go, but if you want a traditional snow roof rake at a sensible price, we recommend you have a good look at the Suncast model, at number nine on the list. However, we can’t get away from how impressive and effective the Avalanche 500 Removal System is, the first item on our list. 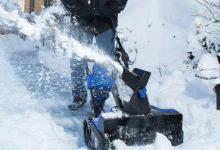 It’s a different concept, and one that provides extremely effective and simple removal of vast amounts of snow in a very short time, and at the price, it has to be the stand-out of all the snow rakes here, so we strongly recommend you give it a second look before you make your decision.